My son and I attend a weekly music class together. Before each of our classes, the teacher passes around a bottle of CleanWell Hand Santitizer, a brand that uses thyme and other plant oils in its formulation. The first time I used the spray, I immediately noticed the unique thyme and herbal fragrance. At first I wasn't sure I liked it, but the smell grew on me over time. The music class was my family's first introduction to a natural sanitizing product that used the ingredient thymol, a component of thyme oil. This past week, thanks to MyBlogSpark and Seventh Generation, my family had the chance to try out some new thymol containing products. 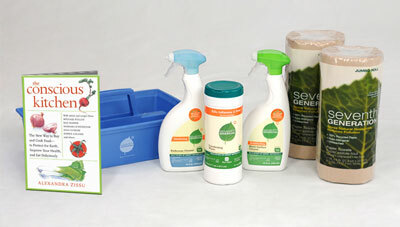 We received the Seventh Generation "Disinfecting Cleaning Kit" pictured below to review. Seventh Generation, a leading company in "responsible cleaning," recently released a new line of household disinfecting products that uses the thymol disinfectant technology developed by CleanWell. According to the manufacturer, the disinfectant products kill over 99.99% of household germs* naturally and are effective against the Influenza A Virus, including H1N1 (*refer to product labels for full details). The products can be used on hard surfaces and are EPA registered. Our thoughts: The essential oils, including thyme and lemongrass, give these products a plant based fragrance. The thyme oil smell is pronounced but not overwhelming. Everyone has their own preferences when it comes to fragrances of cleaning products. I like the natural, herb scent of this new Seventh Generation line. My husband, however, isn't fond of the earthy, botanical smell. (I guess as long as he doesn't have to do the cleaning, he won't complain.) I've used all three products to clean my home, and I'm happy with the results. I used the Multi-Surface Cleaner in my kitchen to spray down the counter and sink area. The Bathroom Cleaner foams up nicely when sprayed on surfaces and didn't leave streaks or film when wiped off with a damp rag. The formula on the wipes tends to create more of a lather than other wipes I've used in the past, but I didn't notice any other differences. What I like most about the products is that they are manufactured by a company that takes environmental responsibility seriously and focuses on safe products for people and the environment. A paperback book titled The Conscious Kitchen: The New Way to Buy and Cook Food - to Protect the Earth, Improve Your Health, and Eat Deliciously by Alexandra Zissu was also included with our kit. Zissu's new book, just released this March, discusses sustainability and how to implement money saving and environmentally friendly practices in your home, especially when it comes to making choices involving food. She has partnered with Seventh Generation to educate consumers about no compromise solutions to clean their homes and kitchens. I found several of the tips in the book very handy. She covers all sorts of topics from food storage to choosing beer and wine. We're trying to pay more attention to what we consume and implement ways to reduce our ecological footprint. Resources like Zissu's book help us stay on the right path toward a greener life. Getting ready for spring cleaning and Earth Day? Win a kit! Thanks to MyBlogSpark and Seventh Generation, one Brimful Curiosities reader will receive a Seventh Generation "Disinfecting Cleaning Kit" that includes a disinfecting multi-surface cleaner, bathroom cleaner, wipes, a copy of The Conscious Kitchen, a cleaning caddy made from recycled plastic, and two rolls of 100% recycled, unbleached paper towels. To enter, leave a comment with the best thing you´ve done for the environment this year. Or, do you have any plans for Earth Day next week? • Contest ends on Monday, April 26th, 2010 at 11:59 PM CST. Best thing I've done this year?? I already use all natural Melaleuca cleaning products and I also use cloth diapers for my son. I don't have room for a compost pile (live in a townhouse with no backyard) but I frequently send my compost home with my mom when she visits :) Nothing to terribly grand, I'm afraid. I am a follower and great contest! I try to continually do things as eco-friendly as I can figure out how. Instead of using cleaning products or solutions I use naturally made ones. My fiance and I grow some of our food so that our veggies etc aren't sprayed and things like that. We also limit our driving to going to get necessities once every week to month. etc. Wonderful contest!!!! Hi - We are moving to Portland next month, and will stop using our car and use public transportation. I added this blog to my reader. I followed you on Twitter (@darwinsbulldog). We do what we can: cloth diaper half the time, compost, grow our own veggies in the summer, walk to errands whenever possible. For earth day we have a date to watch Food Inc on PBS. Already subscribe to you on a reader. Keep up the good work! Finally separating green trash and paper trash from regular trash! Best thing: I sold my car. I decided to share with my daughter, and bike to many errands. he best thing I've done is teach my child to turn off lights and use the sunshine coming through the windows! I'm a new follower and I'm really enjoying your blog! I try to use as few chemicals in my home as possible and for Earth Day me & my kids ( I also run a daycare) will be starting our seeds for our garden this week! The best thing we've done? Teach our son (especially through example) ways that he can help take care of the Earth. Simple things, like saving water, turning off lights, picking up trash. I think teaching our kids is one of the most important things we can do to help our planet! We are using cloth bags when we go shopping. We also are recycling cans, paper, and plastic. We eat in season as much as possible in order to save fuel/transportation from our food being brought in from a distance. We are going to a community clean up day next week for Earthday. Today we are cooking our dinner in our solar oven. This year we started walking instead of driving everywhere. We also started bringing cloth bags to the grocery. We have Energy Star appliances. We compost, recycle and shop with cloth bags. Twitter follower ky2here, please follow back if you can. I use reusable bags for shopping. My husband is melting down styrofoam to paint with it like an encaustic. That's pretty cool to watch! Less styrofoam in the landfills! Every year I go to the county extension for Earth Day. They have free classes on how to create rainwater collectors and give away free native plants. I'm in Florida and native plants here are more able to survive without a lot of chemical treatments or watering. That's good for the environment and easier for me! I got my husband to recycle. Well, I do just about everything recommended for being green and good to our Earth on a fairly regular basis (I've got to get a bit more disciplined about bringing my own shopping bags IN to the store... they tend to get left in the trunk). Probably the biggest thing I've done for the Earth this year is to expand the storage capacity of my rainwater harvesting system to 3400 gallons! I can then use this water for my fruit trees and veggie garden (eating locally and very fresh and healthy!). This year I've begun recycling more things than just aluminum cans. the best thing I've done is teach my child to turn off lights and use the sunshine coming through the windows! I'm volunteering at our local college to clean the nature trail on Earth day. I will also be feeding the birds. Recently I picked up all the trash at my apartment complex. The best thing we have done for the environment this year is to stop using plastic products: cups, plates, glasses, utensils, etc. We are also taking our own cloth bags to the grocery story and not using plastic bags when purchasing groceries. I got a hybrid car. We started composting food waste for our garden. The best thing we've done this year for the environment is starting recycling more and started composting. We've been buying more organic items than during previous years. we went to a one vehicle house. I have been using reusable bags more this year and I am planting a bunch of fruit trees in our big back yard next month. Going green is easier one step at a time. The best think I have done for the environment this year is to participate in a local beach clean up day! To help the enviroment we planted vegetables and flowers. Reusable grocery bags, light bulb changes, water conservation, and use and reuse everything you can. We recently purchased a rain barrel to use when watering plants and our garden. We bought good bikes for everyone in the family so that we can ride all over our small town instead of driving. The best thing I have done this year is conserve energy. I unplug all my appliances when not in use, I switched to the new energy bulbs, and I turned down the heat. I would love to win this! I follow you on twitter and have RT your post. I've tried to car pool more often and turn off the lights when I'm not in the room. I lost my job, so I'm not out driving every day. The best thing I have done for the environment and for myself is to plant some tomatoes. The best thing ive done for the environment this year was I quit using plastic bags. I'm trying to walk more, instead of drive, when it's feasible. We're also doing a big garden this year, for the first time. We are walking and biking more. I weeded a million weeds out of my front yeard instead of using pesticides. Back breaking! Did I say this before? Sorry, I got called away and my brain froze up! I now use reusable bags (I have 15, all FREE from surveys, companies, etc). I started taking bags to the grocery store, not buying bottled water and using more natural cleaning ingredients. The best thing I've done is to start using reusable shopping bags. Thanks for the giveaway! We put a separate trash can in the kitchen for recycling - we have really cut down on our trash! Last week on Earth Day, I taught my K -1 class how to make 2 projects using recycled items. First we made newspaper hats. Then we made "green" reminder signs out of cereal box cardboard with slogans like : Don't waste water! and Be green! The best thing I have done is use cloth diapers on my baby! I started using reusable grocery bags and reusable water bottles. The best thing I've done this year is sign up for the curbside recycling program in my city. We recycle. I cloth diaper,and also use cloth wipes. We try to reuse as much as we can from clothing to soda cans.